I'm delighted and a more than a little excited to announce that my new eBook "The Perfect Shutter" has just been launched! Published by the wonderful team at Craft & Vision, the Perfect Shutter is a book about the creative use of shutter speeds in landscape photography. You can buy it on the C&V website by clicking this link. It's been a number of years now since I first started experimenting with different shutter speeds to create different effects and moods in a photograph. Most often by the sea, but also by rivers and waterfalls, and occasionally sky and vegetation, I'm fascinated by how the passage of time - the 4th dimension - can play a part in an image. It seems strange that you can depict something you can neither see nor touch in a single still photograph, but there it is. 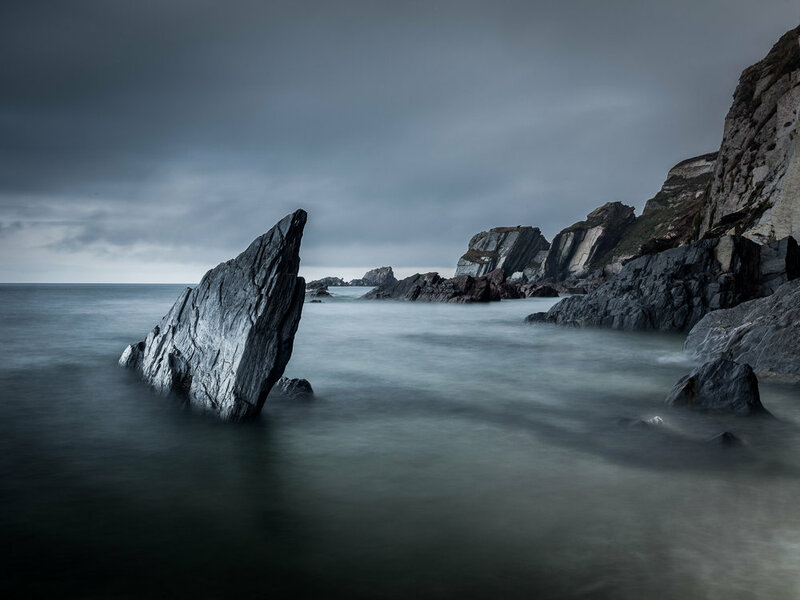 I’m excited to introduce The Perfect Shutter from landscape photographer Duncan Fawkes. Duncan has a body of work that so impressed me that I was thrilled when he said he’d share his knowledge in an eBook for us. In 180 big, beautiful spreads, Duncan shows you how to refine your vision by putting technique into practice, adding stronger mood and intention to your photographs by sharing his knowledge of the basic fundamentals, tools, gear, visualization, techniques, and subjects, before expanding into more advanced topics such as deciphering ND filter numbers, panning, intentional camera movement, and blending exposures. In his “Making the Image” section, Duncan includes 10 photographs that walk you through the how and the why of his personal choices in creating those images. Whether you want to photograph silky waterfalls, energetic waves, the sky, or even the wind, The Perfect Shutter leads you to find your perfect place to creatively capture the landscape as you experience it. Nature renews itself every morning: reframe how you see it. Download your copy before 11:59 PM (PST) on June 15 for just $6.00 (a 25% savings). Learn more. If you'd like to read my book it is available from the Craft & Vision website. Better yet it's discounted from $8 to $6 (25% off) until June 15th, so go grab a bargain! And if you're into bargain hunting they also have a bundle deal with the hugely talented Michael Fyre's Exposure (which I also have and recommend) for an additional 20% off - both books for only $8.80. You can get them both here. Timed with the book release I sat down with Jeffery Saddoris to discuss my photography on the C&V podcast. If you're interested in hearing my thoughts (and a lot of umms and ahhs!) then you can listen to it here. On a personal note, the release of this book is quite obviously a huge highlight for me. Not only does it represent years of work - and the usual cliches of blood, sweat and tears - but also it's a real honour to be featured by Craft & Vision. Regular readers will know how David duChemin through his blog, photography and Craft & Vision were instrumental on helping me onto the right path artistically at the start of my photographic journey. In a sense things have come full circle and I'm so very grateful to contribute back to C&V and its readers, of which I've been one all of these years. I'm very grateful to David and the team for the opportunity and their belief in me. I think the final product looks amazing and I'm very happy with it. I am grateful to and humbled by those of you who have supported and encouraged me all these years. To have people interested and engaged with your work is truly one of the greatest gifts to an artist. I thank you. Buy it now for only $6. Of all image imperfections my personal pet hate has got to be the ‘halo’. Halos are bands of light (or dark) that follow edges in an image. They are most prominent along high contrast edges such as when the land meets the sky. As with other anomalies, halos are to me like signposts that say the artist hasn’t paid enough attention to detail. It’s quite often in the details that a great piece of work is elevated over the mundane. Of course our goal isn’t merely to create technically correct photographs, but such imperfections should be calculated creative decisions rather than demonstrating a lack of care or craft. Anything that doesn’t seem ‘quite right’ in an image gives the viewer a chance to escape and question the making of it rather than enjoying and absorbing it. I feel that part of my goal is to shut the door to the outside world and let the viewer enjoy the world which I have created for them. Note that I say ‘created for them’; the image doesn’t have to be realistic or accurate. Rather I feel it has to have believability within one’s imagination. Technical mistakes break that illusion and cause mistrust. The first two are pretty easy to deal with. Chromatic Aberration is caused by a lens failing to focus all of the different colours onto the sensor at the same point. This results in a ‘fringe’ running along particularly high contrast edges which is usually red or cyan. It is most prominent when using poorer quality lenses but even top of the range lenses exhibit the problem to some degree. Sharpening basically increases the contrast of edges at a micro level, darkening the pixels on one side and lightening the pixels on the other side. As you apply more sharpening (using the Amount slider in LR) then the degree of darkening/lightening applied to the edge increases. In LR the Radius setting determines how many pixels from an edge should be affected by the sharpening. Halos appear when the Amount is very high causing the edge pixels to be over-lightened, causing a bright glow along the edge. If using a high Radius setting the width and so the prominence of this glowing halo will increase. It’s worth noting that there is a corresponding dark halo along the darker side of the edge but this tends to be less obvious. The solution is an easy one; reduce the Amount and/or Radius sliders until the halos disappear (best viewed zoomed in at 1:1). Although different images react differently to sharpening, the Amount slider is usually the chief culprit so it’s worth exercising caution once you get to 60 or so. The default Radius value of 1.0 is reasonable and most people don’t tend to play with it so it’s less of an issue. If you find you have an issue try dropping it down to around 0.7 and seeing if that improves things. The third type of halo is to me much more obvious when looking at an image. It may have a proper name, but I’m just going to call it an ‘edge contrast halo’ as it is chiefly contrast changes along an edge that cause the problem. This may sound similar to what I just talked about regarding sharpening, and that’s because approach is very similar but with a much wider effect. Indeed over sharpening could be considered an ‘edge contrast halo’ just with a relatively small radius. Where the previous halos may be restricted to a few pixels either side of an edge, these edge contrast halos are much wider, taking in tens of pixels. The main source of these types of halos is use of the Clarity slider in Lightroom/ACR. Clarity is a contrast enhancement that’s localised along edges - hence it’s called a local contrast enhancement. I often think of Clarity as being like sharpness that you can see at the big picture level without zooming in. The adjustment will increase the contrast of edges to give the illusion of greater detail and sharpness and is much more obvious. This can be a good thing as our eye is more strongly drawn to areas of greater detail. Judicious use of Clarity can help to push and pull the eye to areas of the image we want the viewer to dwell on. As with sharpening it’s when Clarity is used with too high a value that the dreaded halos appear. They tend to be less glowy than other halos but cover a wider area. To understand what’s going on, let’s look at how you would create a similar effect to Clarity within Photoshop. To perform a local contrast enhancement in Photoshop you use Unsharp Mask, the same tool - paradoxically! - that’s often used to sharpen an image in PS. As discussed when sharpening we apply a reasonable Amount of sharpening in a small radius (0.7-1.0) to increase perceived sharpness at the pixel level. When performing a local contrast enhancement using the Unsharp Mask however, you use a low amount (5-20%) with a wide radius (30-100 pixels) - the total opposite of what we do with sharpening. This means the adjustment increases contrast over a wider area along the edge albeit with a less pronounced effect. As with over sharpening too high a value means one side of an edge becomes much darker and the other much lighter causing halos. The light halos are more obvious but it’s worth checking for dark haloes along the edge of e.g. mountain ridges. Let me demonstrate with an image from Talisker Bay on the Isle of Skye that was causing me some Clarity-induced halo problems. Here’s a version of the image with a number of adjustments but before applying any Clarity. It’s ok, but the water doesn’t demand the viewers attention in the way that I would like. Rather my eye is drawn to the white water across the middle of frame (not so good) before moving up to the sea stack (which is a good thing). It’s definitely lacking some ‘oomph’. Knowing that Clarity will really help draw out the beautiful streaks and patterns in the water, here’s a version with a somewhat over the top Clarity+100 adjustment. That’s much better! The local contrast enhancement in the foreground ripples has done a great job of making them a prominent feature, and I feel my eye is now pulled between there and the sea stack and bouncing quite freely between those two objects. The sky also has much better definition. However now take a look at the top left hand corner. There’s an unnatural bright glow in the sky above the cliff. This is one of the halos I’m talking about. It’s not there in the non-Clarity version, so it’s all Clarity’s fault. Though there are no glowing clouds as the rock face approaches the sea to the left of the sea stack, there’s a very bright edge along the rock face that has that look of over sharpening about it. I like to think of these halos as my mine canary, warning me that I've pushed my post-processing too far. The first, quite obviously, is reducing the Clarity slider to a lower level. This is often part 1 of any solution if not always the full solution. The second solution comes by virtue of how Lightroom works. Rather than making pixel level changes, LR keeps a list of instructions it uses to adjust the image. This means that we can make and stack up several adjustments quite happily. For example if I set a global Clarity adjustment of +100 and then paint with a Clarity -100 adjustment then LR does the maths (100-100=0) and knows not to apply any Clarity in that area. If I wanted some of the adjustment to come through, I could use a brush with Clarity -75 to leave a 25 point Clarity adjustment in the painted area. So in this image, I can completely remove the halo caused by Clarity +100 by using a brush at -100. The temptation may be to zoom in to 1:1 and apply the negative clarity using a small brush size just along the edge itself. In my experience this give you the opposite problem of a dark halo along the edge, where the negative clarity has removed the halo, but it touches the area above where Clarity is still in full effect. I find it’s usually best applied with a wider and fully feathered brush to give it a nice blend with other areas that aren’t being adjusted. An alternative - and arguably preferable approach - is to apply at most a very small global Clarity adjustment. Up to 20 points gives a nice lift to an image without introducing too many problems. I can then use an adjustment brush with a positive Clarity adjustment to paint Clarity precisely where I want it - in this case in the ripples and the waves, and the clouds. This also avoids the other undesirable byproducts of the global Clarity adjustment I performed earlier which brought out too much detail in the cliff face and over brightened the white water. While we're talking about adjustment brushes, another common halo comes from heavy handed use of adjustment brushes that I call ‘spillover’. This is where an adjustment is made but not confined within the appropriate area, causing other parts of the image to be incorrectly affected. Most often this might be brightening a mountain ridge, a tree or a rock using a brush with a positive Exposure adjustment. This might brighten the required object, but often results in a patch of sky being wrongly lightened. There are a few ways to deal with this one. The first is to recognise the warning signal. When editing images in LR I will use the "Before / After” toggle (press ‘/‘), undo/redo or the history panel to get a sense of where I came from. This normally makes particularly heavy handed edits pretty obvious. Alternatively if I take a break and come back to the image later I may see problems I previously missed. If the spillover is very obvious it normally means the adjustment is being overdone in the first place so I’ll start by toning it down a touch. In Lightroom you can use the Auto-Mask option for the adjustment brush to limit the brush from going over an edge. In my experience this is a bit hit and miss, with some spillover to similar tones in the background possible and often creating a dappling effect within the object where some tones fall outside of the mask. It can be useful to toggle the Mask Overlay (press O) to see where the adjustment is being applied. To tackle the actual spillover my preferred approach is to use a decent sized brush with 100% feather and try to paint within the object, not getting too close to the edges. Only the feathered part of the brush should ever fall outside of the object. I then switch to a slightly smaller Erase brush with a lower flow (e.g. 50), still fully feathered, perhaps zoomed in if it’s a tricky edge, and and start erasing the adjustment outside of the object. Ideally I want to remove all of the adjustment from the background, and I use the feathering to reduce it slightly along the edge of the object. I’m not sure why I prefer this ‘apply and erase’ method, but I find it easier than trying to accomplish the same adjustment in one go. Finally for this post Lightroom's Hue-Saturation-Luminance (HSL) panel can also cause you halo problems. The most striking example is where you have an object with a bright blue sky behind. A common adjustment is to lower the luminance of the Blues to darken down the sky to give it more ‘pop’ (sort of mimicking the effect of a polariser). However if you go too far with the adjustment a prominent line will appear along the edge where the edge isn’t quite as distinct as we would like. Even with sharp edges, the edge pixels tend to be a mix of the land and the sky. The luminance reduction only adjusts the purer blues leaving this transition zone behind as a halo (this becomes worse if the edge is slightly out of focus). You may also see this when doing B&W conversions if you drag the luminance of e.g. Blues down in the B&W mix it will turn the sky very dark but can leave a bright halo along the edge. Exercise caution and keep an eye out for these with particularly large luminance changes in the HSL/B&W panel. We’re done. Though lengthy, hopefully the above gives you an idea of things to look out for and suggestions on avoiding them. It’s impossible to cover every eventuality in a post but I think I’ve knocked off the most common culprits. My final trick is to use an adjustment brush with negative Clarity. As well as undoing an overly strong Clarity adjustment it can be very effective in helping soften other halos, bright patches and details that might pull the eye too strongly. Do you recognise these issues? Are there any problem halos you’ve struggled with that the above solutions don’t help with? I’d be interested to hear about them. As is fairly usual when I started out in photography I used zoom lenses. I can’t think of a non-zoom kit lens so it’s typically what most of us start with. I remember being in awe at ultra-zooms' (some with 60x optical zoom!) ability to zoom right in on something almost sniper like. It was like something out of a movie. It felt cool. The biggest problem with a zoom is that it can, well, zoom. This means if I wanted more or less stuff in the frame then I would just twist the zoom ring to change the frame. Because we start out with zooms I think we think this is what we’re supposed to do. The problem here is twofold. Firstly whilst focal lengths control how much is brought into the frame (a wide angle having a wide angle of view, a telephoto having a narrow angle of view) this perhaps isn’t their main purpose. The main aesthetic impact of focal length is to do with the relative size of objects. With a wide angle lens, things close to us are relatively large in the photograph, and things further away progressively - and quickly depending on quite how wide - get smaller and smaller. Intuitively we know that objects that are larger are closer, and objects that are smaller are more distant. A wide angle exaggerates this perspective and helps to create a sense of depth in an image. On the flip side longer telephoto lenses make distant objects appear larger, closer in scale to foreground objects. This is what is called compression, a term I found confusing when I started out as it was always used but never actually explained! A long lens compresses our sense of perspective, near and distant objects are closer in size in the photograph and so appear to be physically closer to each other. Both of these effects are important to understand and invaluable to our ability to make stronger photographs. The problem with zooms is that it is very easy to spend all of our time worrying about “how much stuff” we’re getting in the frame and not enough time worrying about the relationships between the objects that are included. The second issue is regarding position. Position is everything. As Ansel Adams famously said "A good photograph is knowing where to stand." Zooms provide the ability to stay in the same position whilst completely changing the frame of the image. Too much stuff? Zoom in a bit. Tree in the way? Zoom in a bit. Having and using zooms means that we spend less time thinking about our position, using the zoom to compensate instead. Often we stand in the wrong position using an inappropriate focal length for the photograph we want to make. With a fixed focal length lens I can’t just twist the zoom barrel if the framing isn’t right, and if I want things to be bigger or out of the image I need to change my position (or take a conscious decision to swap lenses). It focuses the mind on the effect of focal length, not just in terms of angle of view but in terms of the relationship of objects in terms of scale. It means I can’t be lazy and stay in one spot, I have to move to the best position for the best photograph. Lighter: than a zoom covering the same focal length/maximum aperture. Faster: they tend to have wider maximum apertures to let in more light. Sharper: historically prime lenses were much sharper than zooms (...historically, I’ll cover this in a second). However for me the standout advantage of using a prime is the solution to the zoom's problem; you can't zoom to compensate for your position or framing. A fixed focal length helps to understand the effect of focal length and physical position on an image, as well as the constraint it brings. I swapped to using primes several years ago and I can say that it really works for your ability to visualise images. When you are in the field, shots at familar focal lengths appear more readily. I guess this is because human beings are the best pattern recognition machines in the world; we recognise the things that have worked in the past and can repeat it. Zooms interfere with this pattern recognition. With an infinite number of positions between the zoom limits, it becomes more difficult for our brains to develop those patterns and so to recognise them in the field. I’m not saying it’s impossible of course, but I do believe that primes are a great way to assist the process of visualisation. Almost paradoxically the constraint of a fixed focal length helps me to find more and better shots where I might otherwise be overwhelmed by the options offered by a zoom lens. My experience of leading workshops leads me to believe that the single biggest issue most people (including myself) have is in initially sighting and visualising photographs. Anything that helps with that has to be a good thing. Lighter: an individual lens may be lighter, but if I take 3 lenses at 24mm, 50mm and 100mm instead of the one lens covering the range then it’s probably double the weight overall. If you go the primes route I think you need to embrace the concept of constraint by not carrying a prime for every situation; you spend more time changing lenses and rob yourself of the ability to see with a particular focal length. Faster: most of the time this isn’t an issue for me. 90% of my images are probably made on a tripod, somewhere between f8 and f16 and erring towards longer shutter speeds. My Zeiss 21mm and Canon 24-70 are both f2.8 if I need something faster, but I don’t generally need something f2 or faster (never say never tho!). Sharper: as I said, historically primes were sharper. But in recent years the gap has very much closed and some zooms are very close or compete directly with primes. For example some internet tests (:roll eyes:) of the Canon 24-70 Mark 2 show that it is close to if not exceeding some of Canon’s prime lenses. Personally I find my Zeiss 21mm slightly sharper, but even if primes are a touch sharper I’m not sure it’s in a particularly meaningful way ("does it show up in print?"). Sure you can pixel peep the differences but there are few usages where a good quality zoom is not perfectly acceptable. The lighter overall weight, simplicity, no need to change lenses in difficult/inclement environments, being able to change focal length where my position is compromised (think waterfalls and cliffs) and the good enough (great enough even) results of the zoom win out for me. However going back to zooms means I miss out on the significant creative constraint aspect of the prime, and the ability to constantly see the world at that focal length. When I started reverting to zooms I found the good shot finding habits I had developed with primes starting to slide. I started to zoom just because I could and without giving it too much thought. Fortunately I becamse aware of this and have tried to address it. The most important thing I have done is to stop thinking of my zoom lens as a zoom, but to think about it as a ‘multi-prime’ lens. Most zoom lenses have markings showing key focal lengths (normally popular prime focal lengths). For example on my Canon 24-70 I have markings for 24mm, 28mm, 35mm, 50mm, and 70mm. The practice that I have developed is to pre-select the focal length on the lens. When I visualise an image, I work out what focal length and position I think I will need to accomplish the shot. I will then set the lens to one of 24mm, 35mm, 50mm or 70mm as appropriate, move into position and put the camera to my eye. Often I will get it right or pretty close. Sometimes I will get it completely wrong. I’ve become very used to working at 24mm - and 21mm, I still have my Zeiss 21mm prime lens - so I see shots relatively easily with that focal length. It tends to be at 50mm and 70mm that I still have work to do in visualising the effect of the focal length, simply because I use those focal lengths much less. When I get the focal length wrong by a decent margin I tell myself not to zoom. Rather I lower the camera, reconsider what focal length I should be using, select it, change position, and then return my eye to the viewfinder. Once I have the focal length and position pretty much locked in and the camera tripod mounted, I don’t mind finessing the focal length via the zoom ring to get the framing just so. We’re only talking about a few mm either side, and always trying to think if a change in position would be preferable (even an inch can make a huge difference at wide angle). One particular issue with this approach is that I am still free to change my focal length so it becomes harder to develop that pattern matching ability. A common suggestion is to tape down your lens at a particular focal length for a week or even a month to develop a stronger appreciation for that focal length. Althought I feel I have a good sense of different focal lengths I’m keen to ward off complacency and expect this sense would regress over time using zooms alone. Pre-selecting the focal length definitely works, but I think the discipline of sticking to a particular focal length periodically might also help to keep the vision muscle trained. If you feel you don't have a good handle on different focal lengths or appreciate how constraint helps you to find shots, it might be worth trying the multi-prime approach for yourself. It might seem like semantics, but subconsciously I think it helps to reinforce the value of particular focal lengths. In my last post I talked about what the histogram is and what it’s telling us about our image. Now it’s time to cover how to use it to not only get a good exposure but the highest quality exposure that we can. 'Overexpose' the image so the right edge of the histogram is almost touching the right hand edge, avoiding highlight clipping. Reduce the exposure in post-production to be 'right' - be that technically or creatively accurate. Result is an image with minimal noise and maximal detail. If you're still reading here's the long version that includes the 'why' as well as the 'what' and the 'how'. The shadows of an image (towards the left of the histogram) are susceptible to noise. Noise can be quite prominent in these areas, particularly if we try to brighten them in post-production. There are plenty of articles on the internet that explain in detail why this is. The short version is that the higher amount of electrical noise relative to the poor signal (i.e. lack of light) means that a higher proportion of the shadows are represented by noise rather than true data. Further due to the nature of digital capture, images are represented by a greater amount of data in the highlights of an image than in the shadows. With more data available in the brighter parts, details in the final image can be represented much more clearly and cleanly. More data, more detail. More important than understanding why there is more noise and less detail is understanding that it does happen, and that we want to avoid it if we can. This is where a technique called Exposing to the Right (ETTR) comes in. You may have come across it before as it’s talked about a lot on the internet. I basically use it as much as I can when I'm shooting, so it seems sensible to share my thinking here. The basic point of ETTR is to 'overexpose' the image as much as possible and then reduce your exposure to be 'accurate' in post-production. By allowing more light onto the sensor, the shadow areas now have a higher signal-to-noise ratio and so demonstrate less noise and contain more detail. The key phrase to bear in mind is ‘overexpose as much as possible'. From the last post you'll recall that if we overexpose an image to the point that it’s touching the right hand side of the histogram then we lose detail in those parts of the image. That’s something we really want to avoid. So the trick is getting a histogram as far right as we can without it actually touching the right hand side. To help cement the fundamentals of what the histogram is showing take a look at the image below. The arrows show which part of the image are represented by the different areas of the histogram. Below you can see 3 bracketed shots of the same scene. What I'd like to show you is how the different exposures exhibit different levels of noise. I've matched the exposures in Lightroom with the 0EV image so that we can compare like-for-like. I've then taken a 100% crop of the bottom left corner of each frame and put them side-by-side. I've put the +1EV exposure in the middle so you can easily compare it to the -1EV and 0EV exposures either side. The difference in noise levels between the +1EV and -1EV images is, to my eyes, huge. It's barely perceptible in the +1EV but very noticeable in the -1EV. Even comparing the +1EV to the 0EV shows an increase in noise levels. Let's look at another 100% crop, this time from the sky which was represented by the midtones in the 0EV histogram. Although the noise is less obvious in the -1EV by comparison to the previous example, it is still significant and again shows clear improvement in the 0EV and moreso +1EV frames. The story here is that we really want to expose our image to as much light as possible so that we can minimise the amount of noise in the shadows, and even in the midtones. This is what ETTR is trying to do by moving the histogram as far to the right (and so away from the left/shadows) as much as possible. These are 50% crops of the sun from each image (again matched for exposure). You'll see that for -1EV and 0EV the appearance of the sun is quite consistent. But looking at the +1EV sun it is a very distinct - and in my opinion ghastly! - yellow, losing the red hue that appealed when I was making the image. I don't want to derail this post by going into the technicalities of what's going on so for now let's boil it down to the exposure going a bit too far. We want the histogram to get close to that right hand edge but it's usually a good idea - especially with very bright objects - to leave a little space to avoid 'funky highlights'. In this case I'm able to resolve the issue in Photoshop with a Hue-Saturation-Lightness (HSL) adjustment to bring the appropriate colour back. Hopefully you're with me and you see the value of ETTR. Now let me share my approach. There's actually not a lot to it. In fact it's really quite straightforward! For many reasons I'm a huge fan of LiveView and use it for the majority of my shooting. One of the best things about LiveView on my Canon 5D Mark 2 (now 3) is that it can display a 'live histogram'. This basically lets me see the histogram before I take the shot and so can make sure I get my exposure spot on. Not all cameras have 'live histogram' so my process below needs to be adapted by taking test shots and reviewing the subsequent histogram to get the exposure accurate. The use of LiveView requires the use of a tripod though interestingly one of my favourite features on my Fujifilm XE1 is the inclusion of a live histogram in the electronic viewfinder (EVF) so that I can accurately ETTR even whilst handholding. Switch on LiveView and Live Histogram if you're camera has it (with the Canon 5D2/3 keep pressing "Info" until the histogram appears). Compose the image, set focus, etc. Adjust my exposure to be as far right as possible. If I'm in Aperture Priority mode, I'll use Exposure Compensation to move the histogram as far right as possible. If the graph is touching the right hand side then apply negative EC to pull the graph left. If the graph can move closer to the right then use positive EC to move it to the right. If I'm in Manual mode, I'll use my shutter speed to move the histogram left (shorter shutter speed) or right (longer shutter speed) so that the histogram is almost touching the right hand side. Usually I know what Aperture I want to use and want to use my lowest ISO, so as long as the shutter speed is in a range I'm happy with then I normally use it as my 'exposure throttle'. Review the image's histogram on the back of the LCD. Often it will look different to the live histogram but it's good practice to double check the exposure is good. In another post I'll explain why the histograms are different, and why you can't trust either the live or review histogram 100% of the time. If I feel that the histogram is too close to the right hand side I'll back off my exposure a little (-1/3EC or shorter shutter speed) to give myself a little headroom. I really want to avoid clipping those highlights if I can. When I get back to the studio I'll then import the images into Lightroom and then use the Exposure slider to reduce the overall exposure to my liking. Normally I'm less interested in getting an 'accurate' exposure but one that suits the image and my intent. So for me reducing the exposure is purely a creative judgement rather than a technical one. Given the need for post-processing with this technique I always shoot RAW which also stores extra data that makes it easier to recover problematic highlights if things have pushed too far to the right. Still Too Much to the Left? Often when using ETTR you still end up with peaks in the histogram towards the left whilst the highlights are almost touching the right. This represents a scene with high contrast - parts of the image are very bright whilst others are relatively dark. Most often the bright part of the image will be the sky and the peaks to the left represent the land (many landscape images have a double 'peak' with one being the land, the other the sky). In this situation I will use a Graduated Neutral Density filter to reduce the overall contrast. When people talk about GNDs they often talk about 'holding the sky back'. Instead, as my My highlights are already as far to the right as they can go, I like to think of the GND as allowing me to bring up my shadows. A subtle difference and the result is the same, it's just a slightly different way of thinking. The process for using a GND with ETTR is no different as above. Simply follow the above approach and if you find you still have peaks towards the left, then drop in the GND and use EC/shutter speed to move the histogram further to the right. Of course sometimes the bright and dark areas don't follow a straight line making it difficult to use a GND without introducing other problems (trees, houses or distant mountains with dark tops are all tell-tale signs of GND use). The example image here shows such a situation. The bright part of the image is the sun itself with the rest of the image relatively darker. A GND will help me make the land brighter but I won't be able to lighten the sky any more without losing the sun. Take a bracketed exposure (e.g. -1EV, 0EV, +1EV) and merge the dark and light parts together in post-production. Accept the shot 'as is', expose to the right and not worry about shadows to the left and use more aggressive noise-reduction if noise is problematic. Leave the shot. Perhaps the fact that we can't fit the image into the dynamic range of our camera is in fact a signal from our camera that the shot isn't worth making. Bruce Percy recently published an interesting post about this thinking here. One of the other benefits of using ETTR is that we also capture more granular detail. Digital cameras have a bias towards the highlights meaning that they capture and store more data 'levels' for brighter tones in the image. You may have noticed that image files on your memory card are all different sizes. You might also think this odd given that the number of megapixels your camera has is fixed. This is due to that extra data being stored in the bright parts of the image. So by using ETTR we can maximise the amount of data that is captured which translates into better detail in the final image. Hopefully from this post you can see that ETTR is a good technique for maximising the quality of an image and how easy it is to apply in the field. To me ETTR makes exposure 'easy', I just need to use an exposure that pushes my histogram to the right hand side. The fact that gives me maximum image quality really is a win-win! If you're interested in reading more about ETTR including some of the technical details, Martin Bailey published a good article and podcast recently that's well worth a read and listen (the rest of his blog is a great source of info too, well worth a read/follow). I'd be interested to hear if this has convinced you to try ETTR. Or perhaps you already use it and have extra thoughts you'd like to add to the above. If so, drop a comment in the box below! I offer workshops, 1-2-1s and online training where I can help you with this and many other photography challenges. You can find out more by checking out my workshops page, or by dropping me an email. In years gone by judging exposure was a bit of a dark art. Various techniques such as the Zone System came into being to help photographers to evaluate a scene and how it might expose on film. Fortunately with the advent of digital photography it's possible to get a good exposure with much less experience and judgement. One key advantage of digital is that we have instant feedback via image review on the LCD on the back of the camera. However referring only to the image review can lead you astray. I'm not sure what they do or rather why they do it but images on the back of the LCD have a tendency to make our pictures look 'Awesome!'. However that 'awesome' image often turns out to be 1 or 2 stops underexposed when you get it home. It looks lovely and bright on the LCD but in Lightroom it is dark and in need of some serious work (or binning). In short the LCD tells lies! This is where the histogram steps in. The histogram tells the truth. The histogram is basically a bar chart that shows you the various brightness levels that are in the image. Rather than relying on the image review we can look at the histogram to tell us how bright the image will actually be when we get home and if we need to alter our exposure settings in the field. It tells you if the image is too dark, too light, or has high contrast. Most cameras allow you to show the histogram next to the image during image review so have a look in your manual to find out how to display it. What does a Histogram Look Like? At first glance interpreting a histogram may seem like a black art itself but it's actually pretty simple. Below you can see a fairly typical looking histogram. Underneath the histogram I've placed a gradient that shows the tones from black to white that map onto the values of the histogram. Starting on the far left we have blacks then shadows, mid-tones, highlights and finally whites on the right edge. The height of the graph at any given point shows how many pixels in the image have that particular tone. I've taken the histograms from this post from Lightroom as it's easier than trying to take them from the back of the camera in the field. To the right you can see what the image review with histogram looks like on my Canon 5D Mark II. To try to make this a little clearer I've imported a test image into Lightroom. It's the same gradient as above with pure black on the left and pure white on the right. You'll see that the histogram is pretty flat (ignore the little spikes) covering all of the tones from black to white. If we look at the next image I've actually cropped the blacks and the whites out of the gradient (Lightroom's histogram reacts to what's 'in' the crop). You can see here that without blacks and whites in the image the histogram covers a much narrower range - shadows, mid-tones and highlights. As an aside for Lightroom users the triangles in the corner of the histogram are clipping indicators. I'll cover clipping in a moment but you'll note that in the full gradient they are illuminated to indicate clipping of the blacks and whites. Clicking on the triangles (or pressing the 'J' key) will show areas that are clipped in the image, with clipped blacks showing blue and clipped whites showing as red. Let's consider a couple of problems that the histogram can help us to deal with better than using the image review on the back of the camera. Here we have dramatic underexposure. Almost all of the image data resides in the Black and Shadow regions and the image is incredibly dark. If we go too far to the left such that the graph is touching the left hand side then parts of the image have turned to featureless pure black with little hope of us being able to -re-introduce detail during post-processing. Often images like this can look amazing on the back of the camera and I've been fooled by that in the past. One particular effect of underexposure (not evident in this image) is that it tends to make colours look much richer and more saturated. On the back of the camera that looks amazing, but the histogram is there to tell us we have a problem. If the histogram is predominantly towards the left of the graph with nothing towards the right this often points towards an underexposed image and disappointment when we get home. To remedy we need to increase our exposure. Most of the time I would be using Aperture Priority (Av mode for Canon, A for Nikon) and so my solution would be to dial in some positive exposure compensation (EC), in this case at least +2 (this image is so underexposed that the camera wouldn't underexpose this scene that much). Note that in real life scenes do often have areas of black where our eyes can't make out the details in the shadows, so some blacks in our images are not only fine they're actually quite desirable. We don't need to worry too much if some of our histogram falls off the left hand side, we just don't want all of our image doing that or being on the far left. Perhaps obviously the other big problem the histogram helps us with is the opposite of underexposure - overexposure. Here the image has been totally overexposed. Everything is very bright and washed out. Some parts of the image have turned to pure white (often known as 'blown highlights'). Again you can see the illuminated triangle in Lightroom indicating highlight clipping. As a sidenote you'll note that we talk about 'highlight clipping'. Most literature and cameras reference the brightest tones as highlights yet Lightroom calls this region whites. I think this is a little confusing and to me highlights are a subset of whites (the very brightest). Anyway be careful that it doesn't catch you out in Lightroom! If the histogram falls off the right hand side of the chart like this then those areas lose all detail - they become pure white. If we were to darken the image in post-processing we would see big white patches circled by weird looking colours that you've likely seen for yourself. Of all the things we want to avoid with digital photography it's blowing those highlights as it creates awful looking featureless patches in our image that even a casual observer will identify as a technical flaw. As well as seeing the histogram hugging the right hand edge like this most cameras provide a 'highlight clipping warning'. Commonly called the 'blinkies' they show the areas of the image that have had their highlights clipped. Note if you use RAW these blinkies (and indeed the histogram itself) aren't 100% accurate and you often have a little more space to the right before the highlights truly clip. Consider them a useful indicator rather than the absolute truth. To remedy we do the opposite of underexposure. If I'm shooting in Aperture Priority I would dial down my Exposure Compensation by -2 to get a better exposure. Sometimes some blown highlights are ok and in fact are unavoidable. For example a bright reflection on glass or metal and even the sun itself are just too bright to capture detail in and so we just let them blow out. But using the histogram helps us to make sure everything else is kept in check. Similar to an underexposure we should be wary if all of our peaks are in the right hand side of the histogram with nothing to the left. The next image is very much faked to show another common problem - where there's a large difference in contrast - from very dark to very bright. You can see here that we have a histogram that's falling off the left side and the right side of the chart. This is telling us is that it's physically impossible for the camera to fit the dynamic range (contrast) of the scene into a single frame. This is a common problem when taking photographs during the day where the land is relatively much darker than the sky. The problem becomes much worse at sunrise and sunset where the sun approaching the horizon makes the sky in that direction very much brighter. Without some jiggery pokery the only way we can retain either blacks or whites is by making the opposite end of the histogram worse which we don't want. There are typically two ways that we deal with this situation. The first is to use neutral density graduated filters. These are dark in the top half and clear in the bottom half thereby reducing the difference in brightness between the bottom (land normally) and top (sky) of the frame. These come in various strengths (2-stop, 3-stop being normal) and abruptness of transition (hard or soft). If this is the route you take then I find that a 2-stop hard GND is the most useful. Alternatively you can take multiple exposures - one for the whites and one for the darks - and then merge them together in post-processing. How to achieve this is beyond the scope of this article but you may find this post useful. The histogram here is fairly usual of a landscape that includes land and sky, and shows a better exposure for this scene. The relatively darker land is represented by the lefthand peak on the border of the shadows and the lower mid tones. The relatively brighter sky is represented by the right hand peak in the upper mid-tones and highlights area. The histogram has a reasonable spread of tones from the shadows through to the mid-highlights. Even so the histogram shows that the image is lacking in contrast. You'll see that we have no peaks in the Blacks, Whites or upper Highlights. You often see this when processing RAW files where they have no contrast adjustments applied in-camera. In this next image I have improved the contrast by pulling the left hand edge of the graph towards black and the right hand edge towards white to create a punchier, more dramatic result. Note that many scenes don't actually contain a wide contrast range running from black to white, and so if we push the contrast too much the image begins to look unnatural. There's an argument that the below image has had its contrast pushed too far. Before wrapping this post up I should probably point out that there's no such thing as a 'good histogram' in an abstract sense. You can't ignore the image itself and decide if the exposure is good just by looking at the histogram. The histogram, quite obviously, represents the image data and so is completely dependent on the contents of the image and the the tones within it. It's quite possible that a histogram might look like that of an underexposed image but may in fact represent a perfectly exposed image if it contains a lot of dark tones. Similarly some scenes may look overexposed when in actual fact they just contain a lot of brighter tones. The histogram isn't a magic tool that boils photography down to matching a 'perfect' histogram. We still need to develop an ability to read the scene and its tones to understand what a good exposure would look like. The histogram is a fantastic tool in helping to develop this understanding, so it's a bit of a win-win. ...And fortunately there's a reasonably foolproof way to use the histogram to get a consistently good exposure. That will be the subject of the next post.